The Katsura tree (Cercidiphyllum japnicum) is a rare, fast-growing, spreading tree. It is distinguished by its dainty leaves, which are heart-shaped land range in colour from light yellow to a light grey to pink in autumn. These flowers are also lightly fragranted with a cooked sugar type aroma. Expect this tree to reach a final height of some 15m (50ft). 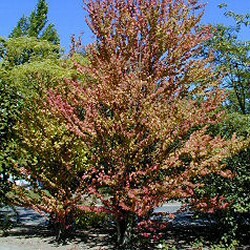 We think this tree is best suited to a lime-free soil as this brings out the best colour. Our Katsura trees are supplied at a height of between 1.25 to 1.50 metres in a 7 litre container, which means that the tree can be planted any time of the year and with better results than either bare-root or rootballed trees.